Covering all London areas, Slough, Reading and the Home counties, JG Environmental take pride in being a family run business suiting the needs of the general public, because of this we have built a reputation for excellent service at very reasonable prices. Please call the above number to discuss your requirements. JG Environmental are the leading pest control company in London. 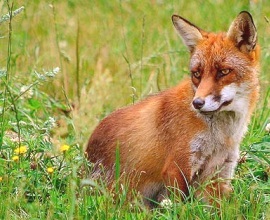 We have specialist a specialist fox control team that deal just in the eradication of foxes. Because of this we can provide the most comprehensive fox removal services in the industry. If you have seen foxes in the garden and recognise a fox problem it is vital that you call a professional. Foxes can be dangerous to children and pets. Common signs of a fox or foxes include the obvious physical sighting as well as droppings which are approximately 3-8cm long and about 1.5cm in diameter with sharp or ‘pointy’ ends. It is not a good idea to attract foxes by feeding them as this can encourage them to make a den nearby, and when they nest they will breed usually between 5 & 8 kittens, although instances with as many as 13 kittens from one litter have been reported. Our control methods for fox removal range from day and night culls/ shoots, deterrents, humane traps and proofing to prevent access by foxes to your property. The most effective way of removing foxes from a property is either repellents, humane trapping or a shoot. There are few pest control companies that effectively carry out this work, JG Environmental are the leading company for this service in the area. Following a cull or trapping program it is often recommended that you have a repellent treatment carried out to prevent foxes from returning. The science behind this is that the scent applied mimics another skulk (group of foxes), and due to the territorial nature of foxes they will more often than not then seek alternative refuge. If you think you have a problem with foxes and need a professional, please call JG Environmental now to discuss your fox problem requirements on 0207 183 8906 .